The river seemed lower than ever, and the water temp was down again. Hopes weren't high, but so long as there's a bait in the water there's a chance. One good thing was that the after-dark air temp stayed up and it was a pleasant evening. But I'm running ahead. 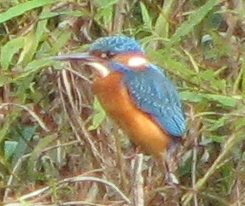 As I was settling in to the swim a kingfisher was active on the far bank. Perching in the willows and diving for fish with more success than I was to have. With the low, clear water I opted to fish a small hookbait on one rod. In this case a piece of plastic maize. The bags of pellets were kept small, about walnut size, on both rods. Leaves weren't a problem, but there were clumps of weed coming down with the flow which made it difficult to hold a bait on the far side for long. Nonetheless, shortly after a recast the far bank rod top started tapping in the manner symptomatic of a chub that isn't going anywhere. I picked the rod up and struck, connecting with a fish of some sort, and a large lump of weed on the line. This lot then kited across to my side of the river. I could see the weed on the surface and what looked like a gaping chub mouth under the surface a few feet behind the weed. When everything got directly downstream of me the fish woke up. Turned. Slapped its tail on the surface and was gone. I fished into darkness in that swim, then moved to another spot around seven thirty, where I remained biteless until midnight. The only thing of interest (if you can call it that) was a cow on the other side of the river staring at me for almost an hour. No, it wasn't interesting. But it was strangely unnerving.